During Mr. O’s stay at Cortlandt Healthcare, he was very determined to regain his strength and eventually be discharged to his home. He came to Cortlandt Healthcare with a right knee brace and mild back pain. His baseline in therapy was fair. He required a one person assist to help him with tasks as he experienced some difficulty shifting his weight from one leg to the other. The start of the rehabilitation journey is never easy; it takes patience. 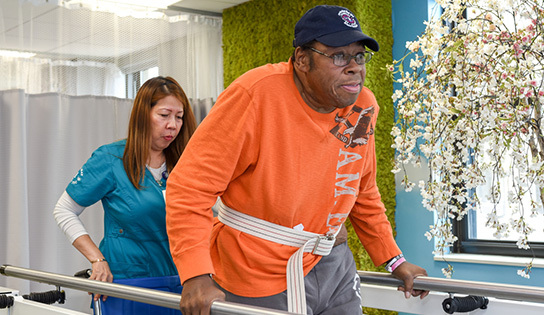 At the beginning of his physical therapy sessions, Mr. O was only able to walk a total of five feet and was not able to use the stairs, which was needed for a safe discharge home. However, after receiving physical therapy six days a week for a few weeks, Mr. O was able to gain momentum and muscle in his legs. His overall performance improved. He progressed from walking five feet to 100 feet in just four weeks, and then with motivation and perseverance, he was able to walk 150 feet with his rolling walker! Mr. O had amazing sessions with the physical and occupational therapy service team. He and the staff focused on upper and lower body strengthening, balance and gait training. They also focused on effective methods to increase functional mobility with activities to get back to his daily living. Upon discharge, Mr. O was able to transfer to and from his bed independently, ambulate with a rolling walker, perform proper hygiene for himself, and demonstrated his activities of daily living without any assistance from the staff! He was safely discharged home with his wife and continues to do very well. The team at Cortlandt wishes you nothing but the best as you continue to strengthen and heal, Mr. O.